If you think about the trendiest messaging application, WhatsApp is the name which comes first in our mind. In last few years WhatsApp has spread its market across the globe. The main cause of its popularity is its simplicity and easy to use interface. That is why anyone may use it without any inconvenience. Today there is not a single Smartphone which doesn’t have WhatsApp because it provides pretty much user friendly platform to the users. People sometimes ask that whether they can utilize more than one WhatsApp account or 2 whatsapp in one phone. 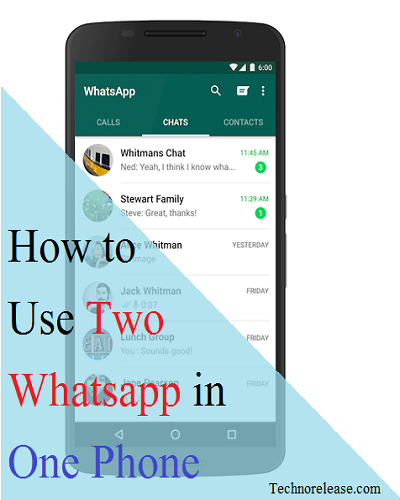 For those people, we are giving this article that will let you know how to use two whatsapp in one phone or in short we say that Dual Whatsapp. The Android Lollipop OS’s Multi-User feature let you utilize multiple Whatsapp account on a single phone. To do that you just need to follow below given simple steps. Step 1: If you are Android Lollipop based Smartphone user than you have to add Multi-User feature in your phone. Go to Settings, find Users option and then tap on Add User. Step 3: Now pull down the notification bar and switch to the New User and then tap on New User option. Step 4: Once you’re back to the New User, you’ll be given a new phone interface with default settings. Step 5: Install WhatsApp messenger on your phone in New User Mode. Step 6: After finishing download, fill all the details. By just doing this, now you’ve successfully launched two Whatsapp account on a single phone. Congratulations! Now you may enjoy log in two Whatsapp accounts in a single phone. Apart from this you may also do that by downloading external applications from play store. To get more idea about this, follow further procedure. If you are having a rooted android phone and willing to Run Two Whatsapp Accounts in One Android Phone. SwitchMe is a better option for you which enable you to do that. The multiple accounts handling application assists you to log in but it do not allows you to access different profile from the currently logged in profile. Here are some simple steps which should be adopt while utilizing two Whatsapp accounts in a single phone. Step 1: If your phone is not rooted yet, then root it first. Step 3: If yes, then next install SwitchMe app from the Google play store. Step 4: After successfully installation of SwitchMe, run this application. Step 5: Now create a SwitchMe user account with your name. The account will be considered as an administrator account that may access your app settings and reflect your Whats App. Step 6: Further, create a different WhatsApp profile with another name. Step 7: Now, restart your phone and then again install official Whatsapp and then register it for the varying number. Congrats! Your Multiple WhatsApp account is ready to use on a single phone.